To complete the preserved fish hat trick I give you smoked salmon! Such an elegant accompaniment to celebratory drinks. My mother has included smoked salmon in the pre-dinner nibbles for many a celebration. Her favourite is to serve the salmon on lightly buttered pumpernickel rounds with a light grating of black pepper and a fillet of lemon on top. I had recently made a multi-grain loaf and this seemed like a nice variation on the pumpernickel theme, thinly sliced. 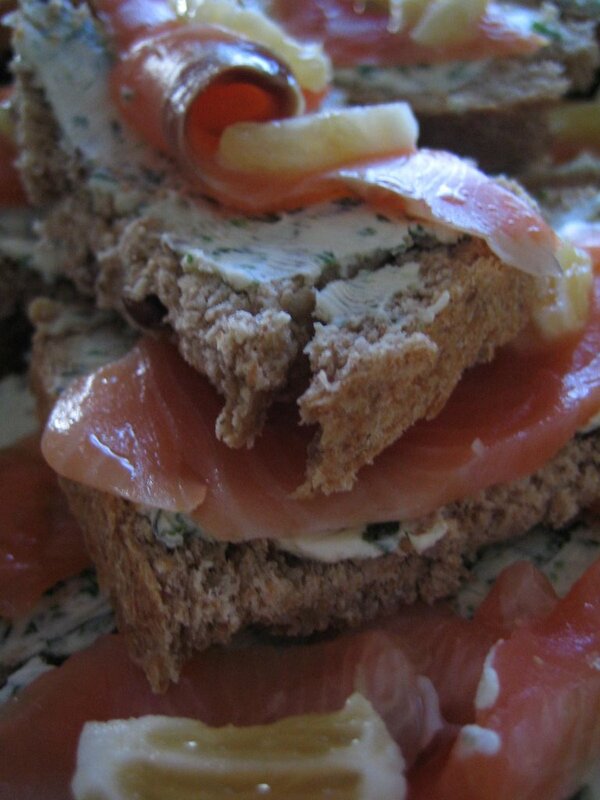 A herbed cream cheese made the salmon stick to the bread and quarters of peeled lemon completed the picture. Lovely! Oh yes. Supreme! And all before Christmas dinner to boot - I'd be totally satisfied just sampling the snacks let alone getting onto the more traditional fare. This would wash down well with Greg's black beer or again with a nice cold still - A sauv perhaps? I think using dry-vaccum sealed Canadian salmon would be the deluxe way to go for on this one, but it can be quite hard to get unless you know a Canadian. Fortunately I know a Canadian at work! !